This experience, shared by a reader, should remind us all of an important laundry safety tip which should remember for detergent and all laundry products -- keep them out of the reach of kids and pets! It seems that the Free And Clear Kirkland Laundry Detergent is attractive to dogs. I have kept the laundry detergent bottles on the floor of the laundry room for many years with no problem. Recently I noticed the the Free and Clear bottle said "improved". There is no dog warning on the bottle. A couple of weeks ago my black lab took a 1.4 gal bottle of Free and Clear to his bed, unscrewed the cap and drank the laundry detergent. Somehow the other lab drank it also. I am wondering if there is something in this paticular detergent that attracts the dogs? They threw up all over the house and I called the Vet and ASPCA Poison Control. I took them to the Vet and they got a shot and some medicine to take for a week. They thew up many times and had a gagging cough. The gagging cough continued for a couple of weeks and I kept them quiet in the kitchen. Around 3 weeks later one dogs is fine and the other still has intermittent coughing. harm on their liver and kidneys that this event might have caused. I'm so sorry this happened to you and your pets. I hope all of you feel better soon. I know you mentioned this incident as specific to one detergent, and perhaps there is a safety issue dealing with this bottle and packaging, but this unfortunately a common problem. 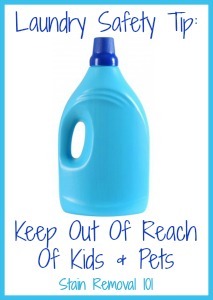 We seem to forget that laundry supplies in general, both detergents and other products, should be kept out of reach to keep our kids and pets safe. I know I have been guilty of this many times, and this just reminds me to look at my laundry room and put things back away where everyone will be safer! Everything should be on a high shelf or behind cabinet doors with kid safety latches. Plus, remember that while all detergents are not good to ingest laundry detergent pacs, which are highly concentrated and look yummy to little children, are even more dangerous. Here's an example of problems people have had with Tide Pods. Does anyone else have any laundry safety tips to share, or stories similar to this that you'd like to share? If so, you can share your tips here.